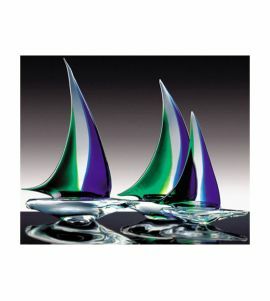 Welcome to our collection of Murano Glass Sailboats in crystal glass, handmade using the traditional wheel and then pulled hot. The colors which enhance the qualities of these wonderful art pieces are green, pink, blue and yellow drowned in the crystal clear glass. 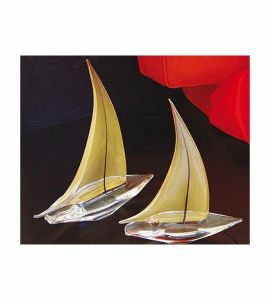 These are perfect decorations for your home and also wonderful gifts. These Venetian Glass pieces can also be successfully used to tastefullt decorate marine themed restaurants, teahouses and bars as well as hotel lobbies in seaside resorts. The elegant shapes will make them appropriate for any style of furniture and any architecture.